.......53 Buddhas and Me .................My Life Adventures.....: Where do I come from? I have just finished watching a show called “Who Do You Think You Are?” which has been on weekly and it features famous people researching their ancestors. Tonight it was the actor Matthew Broderick’s turn. He was able to with help trace his lineage back 150 years. I find genealogy fascinating and would love to get into it more but that is one of the things in my life I keep putting of. One of my cousins has partially put together my mother’s family tree, even back to the original prisoner being sent to Australia from England. I would like to try and fill in a few blank spots with that side. Then there is my Dads family tree!! As I am an only child and my Dad was an only child you would think it would be easy, but oh no not with my ancestors. You see I don’t know for sure who my Dads father was and it’s a long confusing story – way to confusing to go on with here. But one day I will get to it and find where I come from in all the branches. There is so much information out there where do you start. Luckily I did get lots of information from both Mum and Dad before they left me. One time I was asking Dad about his Aunties and Uncles and he started telling me about his Auntie Tina. I was madly writing everything down that he said, so I asked “Oh, what was her surname”. Dads answer got me laughing for a while but he didn’t know why. 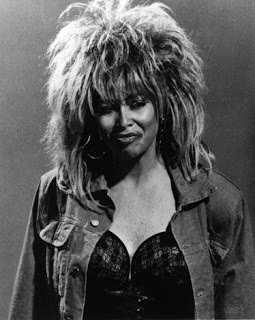 Her surname was “Turner” – so his Auntie was “Tina Turner”. Not the real one of course, but it still gave me a chuckle, but of course Dad didn’t realize who I was referring to until I explained. Mum got it and had a laugh along with me. “Living to Learn” – I found the website www.ancestry.com.au which may help me get started on this journey. “Davine Time” – Shouted myself Chinese Takeaway from my Dad and my Chinese Restaurant. It certainly is a fascinating process, Davine. David has been researching his family and regales us with regular updates - he discovered connections to the Mayflower! Loved the Tina Turner connection. LOL. There's a resemblance. Both strong women...how are your legs? Tina has some great legs. Family trees are so interesting. Mine is full of holes. Figuring it out and filling it all in has been on my "to-do" list for years. I've seen this tv show advertised but haven't caught it yet. I'll check it out now. Thanks for the tip.